There’s a party going on in Braddon. No, not a house-warming party on Ijong St, a cafe-warming party on Lonsdale. 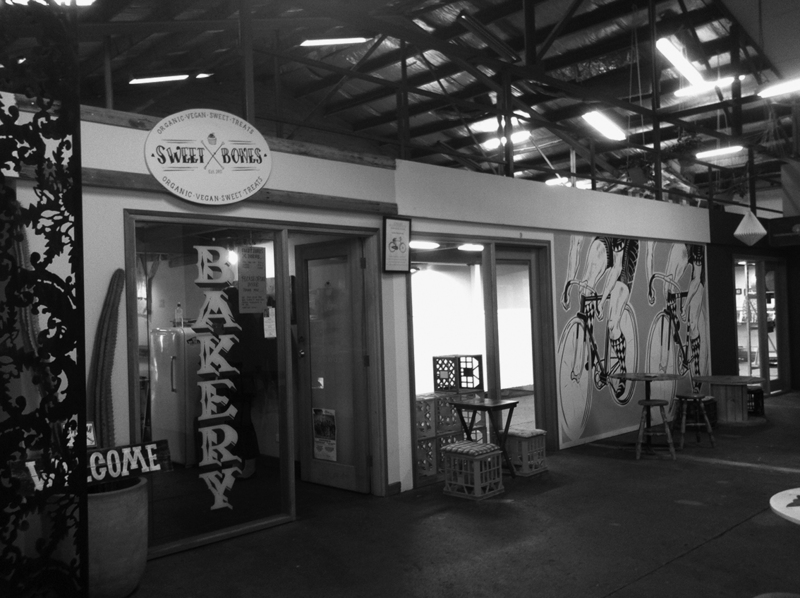 Since Sweet Bones Bakery and Cafe opened in November 2012, the invite reads Vegans (and All) Welcome. The Canberran knows a spattering of things about the Sweet Bones family. We know they’re the surfabilly types serving stuff in the middle of the Lonsdale St Traders “warehouse”. We know they are responsible for the cutesy collective cafe space that rubs shoulders with some seriously trendoid tradespeople. We know they’re serious Vegan foodies namely, to the extent of having appeared on the token Vegan episode of Ready Steady Cook. We know that we keep getting summonsed there to meet people for coffee, and we rarely fail to appear. 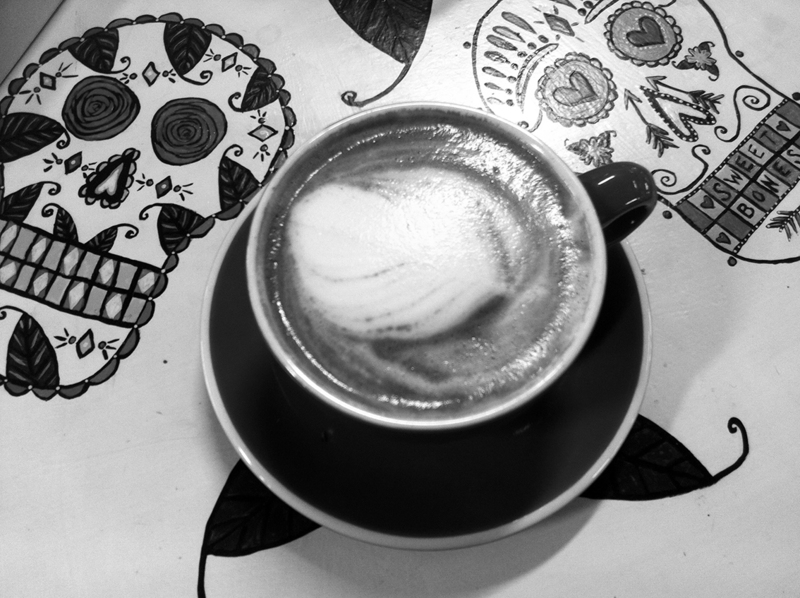 Do you like the coffee at Sweet Bones? The Vegan: Yes, in general. 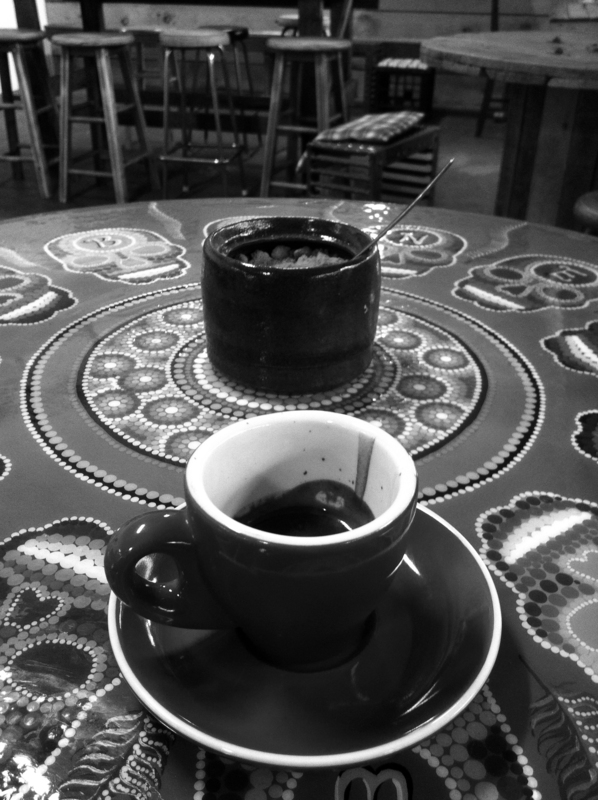 Had a very good long black there the other day. Barrister Barista: we agree, in general. Because we were in Rome, we drank soy milk, Bonsoy (trademark) poured with panache. The Long (Flat White) was a little bit globby around the edges (steaming that stuff must be a nightmare), but it had a warm honey toast and coffee flavour. The Short Black was yeasty and bright. Have you ever had an almond milk coffee? Would you? The Vegan: No. I would probably try it. Barrister Barista: No. We probably wouldn’t try it, as it’s $5. We heard others doing so: ‘regular Almond Latte, take-away?’ It’s a thing. Are the cupcakes and muffins at Sweet Bones as good as they look? The Vegan: Yes. Best vegan cupcakes in Canberra. I even like flavours which I would never have thought I would like (eg peaches and cream). Muffins also excellent. Brownies superb. Also very impressive that some stuff is vegan and gluten free. Barrister Barista: It is impressive that stuff is both vegan and gluten free. That’s some seriously restricted ingredientage – a ‘don’t try this at home’ brand of baking. We had a vegan gluten free pie at some point. Pastry and everything. It wasn’t bad. How is the main food – nachos etc? Are Sweet Bones doing things well? The Vegan: Some things are very good. I had the tempeh burrito thing the other week (“the Gobbler”) and it was delicious. The nachos were okay (I did miss out on the chipotle ‘cream’ because my friend asked for it without, so I may have been more impressed). They also change their menu, which is nice. Sometimes things seem a bit overpriced for what you’re getting (e.g. the bagels). But see my remarks below about boutique-ness. Overall, it’s better for lunch than for breakfast, because the food is really mostly lunch food. That said, I have had breakfast there the last two weekends. Barrister Barista: We defer to the Vegan. The Vibe is certainly different at breakfast time. At 8am of a weekday, it was spooky-quiet. 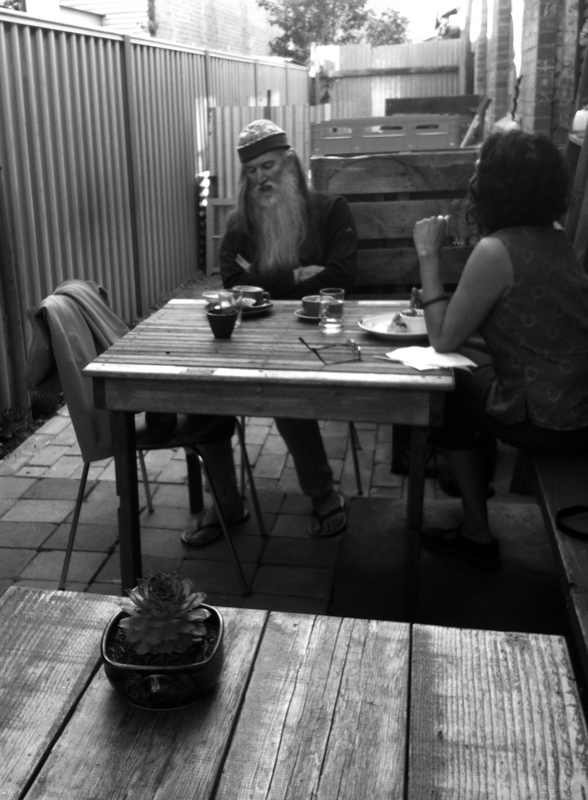 Old people eating avocado toast remarked ‘it’s so peaceful, not like that busy place down the road [the new Roasters].’ Note to selves though, if looking for a quick takeaway on a rainy day (after 8), Sweet Bones could save you a second. Beware, may induce purchase of cupcakes. Does the aesthetic please you? The Vegan: Yes. Might get a bit cold in winter? Barrister Barista: Yes. When the eclectic tables are full of pretty people, the centre-warehouse set-up definitely works. Traffic passes, and the museums of hipster culture (or “shops) are pretty to look at. Without the pretty people, the uni-dorm-room white wall with random photos (does that even belong to Sweet Bones?) looms a bit large. 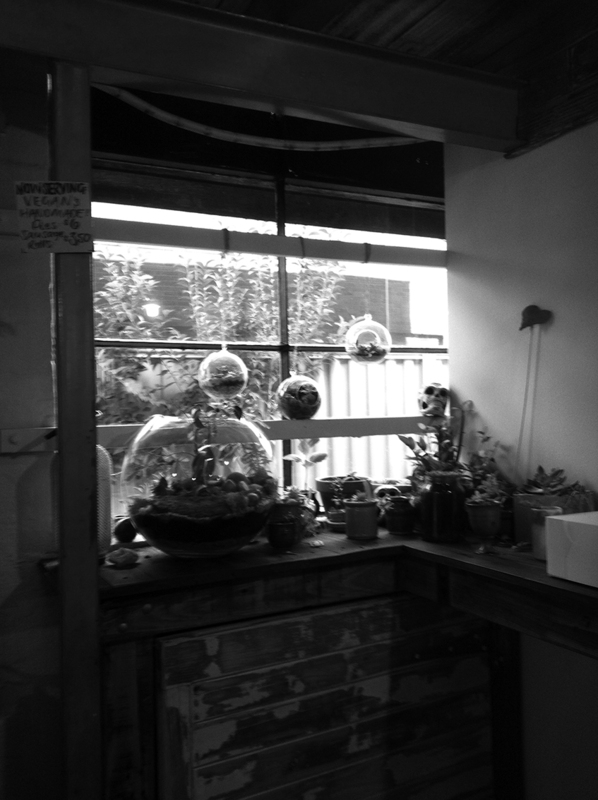 We also just discovered that you can sit out the back, just behind the window with a terrarium #trendingnow. It’s backyardy. Are the staff at Sweet Bones nice to you? The Vegan: Yes. Very nice. Barrister Barista: Yes. The Hipster Factor is high, but in this case, the presumption of hipster rudeness is rebutted. The Vegan: In some senses they’re a little expensive ($5 for a cupcake), but it is ‘boutique’ and I’m happy to what’s necessary for [Sweet Bones] to stay in business. The cupcakes clearly have a fair bit of time put into them, and the economies of scale can’t be that great. 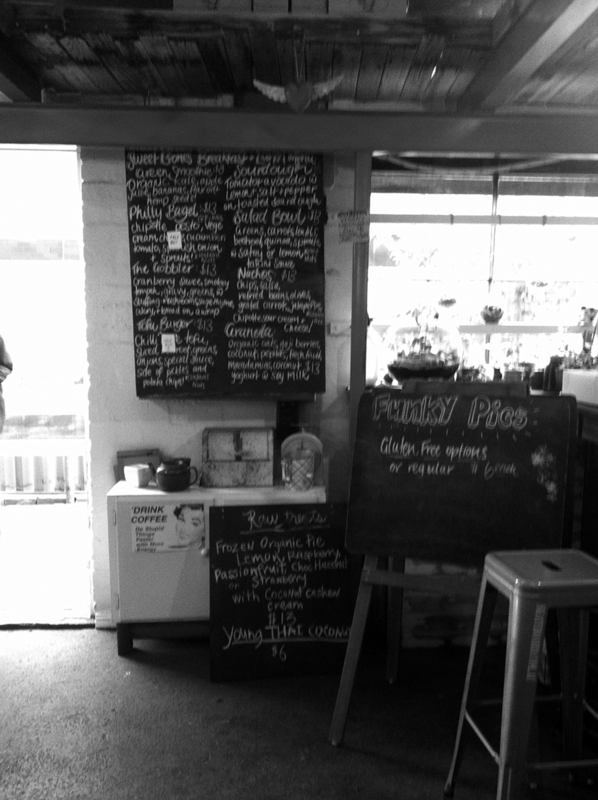 Food prices are comparable to other Canberra café prices. Barrister Barista: We defer to the Vegan on this point. In terms of coffee, the soy (at no extra charge) is exactly the same price as it is around town. This makes the milk coffee 50c more expensive that it is around town. OK, we’re splitting hairs. The Latte Word: Case closed. Based on expert witness testimony (sample size one), Vegans love Sweet Bones Bakery and Cafe. Based on an equally large sample size (results not recorded herein), Coeliacs do too. How about you, regular Joes and Josephines? 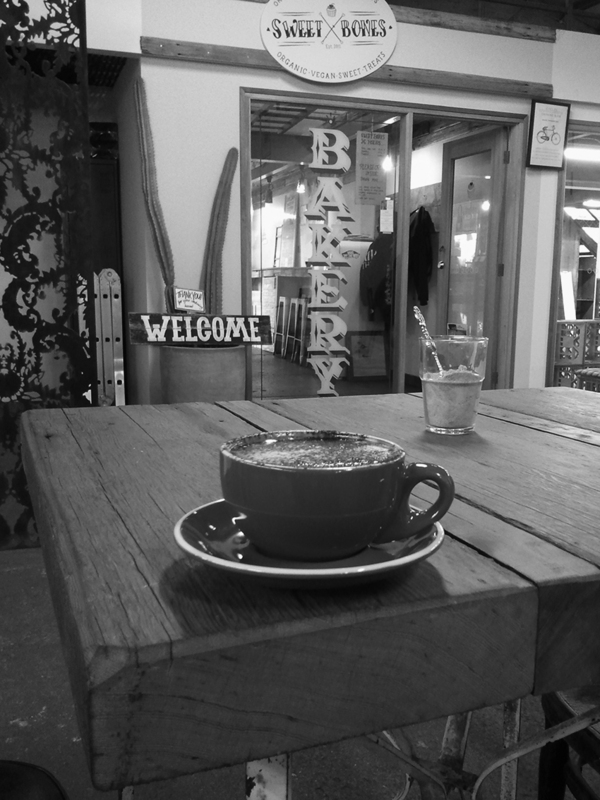 To mangle that old cliche, is the coffee at Bones ‘Sweet enough as it is’?